TJ met someone who has become salt and light to him. Rob Barber has a day job in communications but he visits the local jail as an outreach ministry volunteer with Salt and Light Ministries in Ashland, Kentucky. Rob teaches bible study and then walks from cell to cell talking to each of the inmates once per week. TJ was skeptical of the bible study but finally joined when he saw others making legitimate changes in their life as a result of the study. Once TJ joined, Rob was able to share the gospel with him and model how to follow Christ. TJ accepted Christ as savior and is willing to share the story of his changed heart (and his baptism certificate) with you. 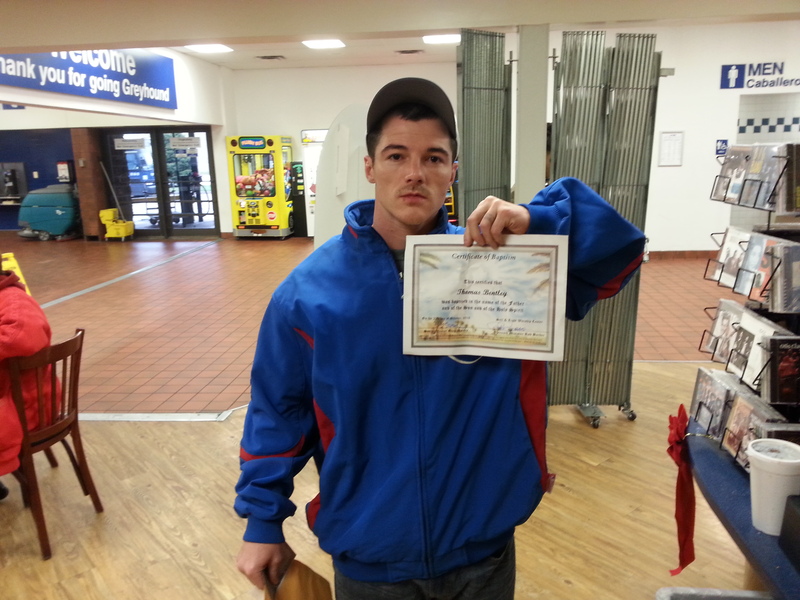 Since TJ’s release, Rob has arranged for temporary housing for him in Ashland, Kentucky. 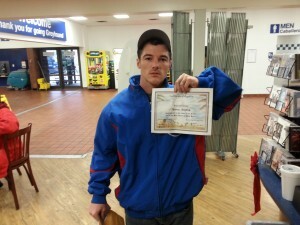 TJ wants to work on his marriage and find roofing work. Sounds like Salt and Light to me. Will you pray for TJ and Rob? If you are interested in participating in jail ministry in the Cincinnati and Northern Kentucky area, please reach out to Pete Shockey: prrshock@aol.com. 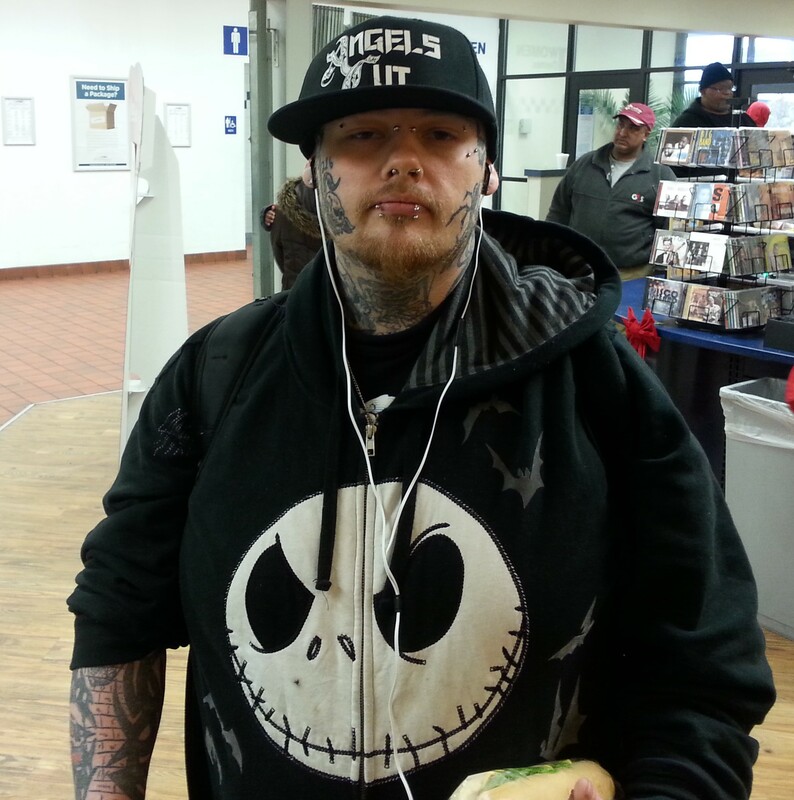 Would you judge John by his 200+ tattoos? John’s favorite tattoo is on his face: a scorpion body with a human skull. It symbolizes a warrior who has endured a huge battle. His battle? John’s girlfriend died during the process of getting a tattoo from John. The heroin she snorted in the bathroom was the cause of her death. John was battling the bite of that scorpion. John and I talked about eternal things. John believed that God would let him into heaven because “he was making lots of improvements” in his life. We discussed the concept of justice and the punishment due John for the crimes he committed as a young man …despite the improvements he had been making. John agreed and said that in that case he would accept whatever punishment was coming his way. So we discussed hell, the need to avoid it all costs, and the gospel of Jesus Christ. I did what you would have done: I bought him lunch and told him I would pray for him. Join Evangelize Cincinnati and meet guys like John (and you and I) who need to hear the gospel. Option 1: Vote for Charlie from MSBC. 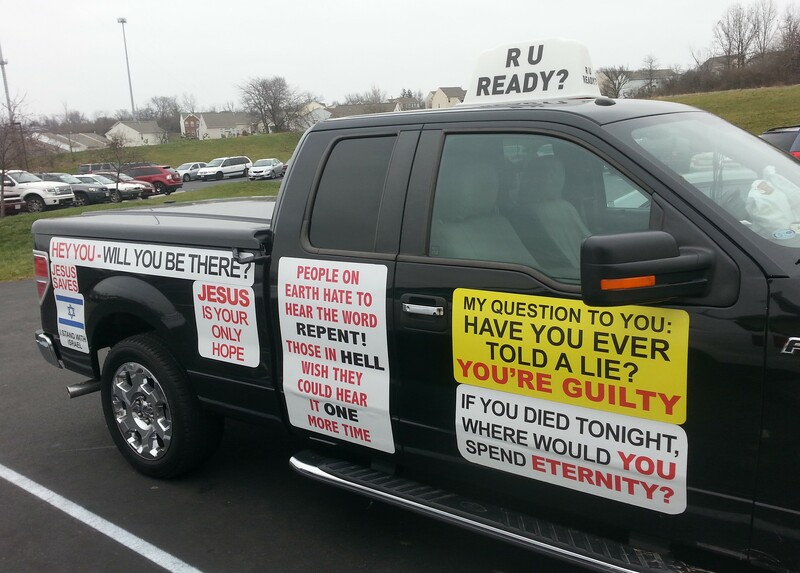 Truck Evangelism may not be your style, but this biblical evangelist is bold, agreed? In 2015, let’s make it our goal to make as many impressions as Charlie. Option 2: Vote for Jeffrey Fowle. 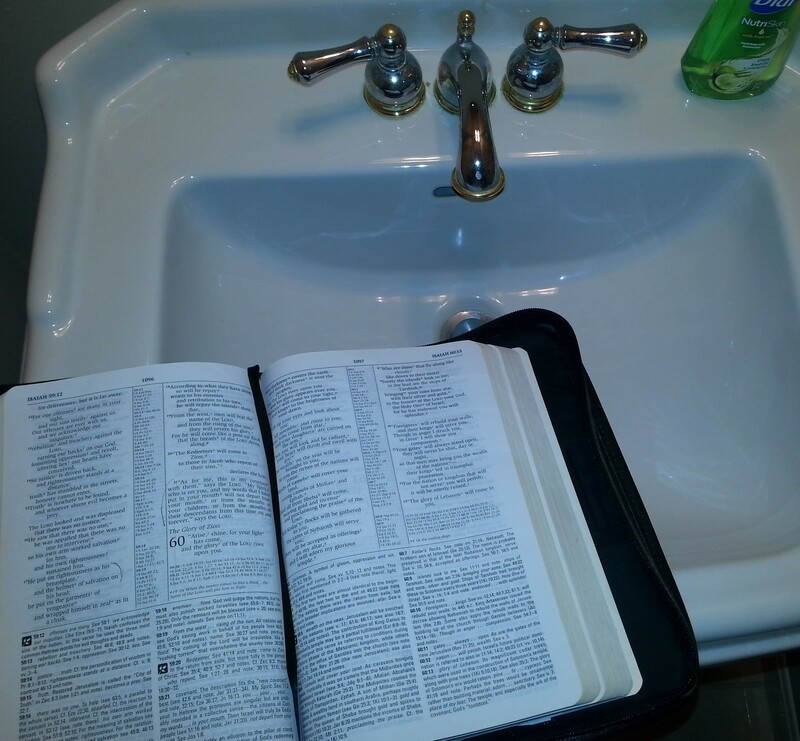 Jeff left a bible in a washroom in NORTH KOREA. Jeff lives in West Carrollton just north of Cincinnati. You don’t have to go to North Korea to do biblical evangelism. Join us in North Kovington and share the gospel. Option 3: Vote for Big Boy. 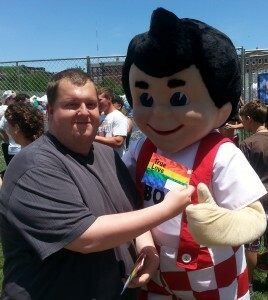 Chris shared a gospel tract with Big Boy. Somebody shared the gospel with Billy Graham and look what God did through him, right? Imagine how many people an evangelist like Big Boy can reach in a year: 3 meals a day times 120 area restaurants. Vote for your favorite biblical evangelist by making a comment using the comment button ABOVE this post. Eric has recently become a Monk and has given his life to serve God in the Orthodox Church. He will serve the homeless. Eric prays three times a day, reads religious material and prays his rosary. Chris asked Eric, “What if you have not done enough works?” That made Eric think. We explained biblical Christianity … It is great that you are giving your life to God but your past sins still demand punishment or payment. So we talked about faith in Christ alone and the finished work on the cross. We talked about the role of works and shared Ephesian 2:8-9 and John 6:28-29. Pray for Eric. 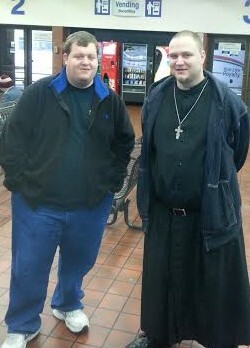 Evangelize Cincinnati would like to invite you to join us as we meet monks and other interesting people.